This is one of many beautiful sunsets I’ve photographed here in Arizona. One of the most striking characteristics of sunsets is that they are colored predominantly red-orange-yellow. Why is that? Light from the Sun consists of a mix of all colors in the rainbow. Earth’s atmosphere is 78% nitrogen (N2), a molecule with diameter of about 0.1 nm (“nm” = “nanometers” = 10-9 m). 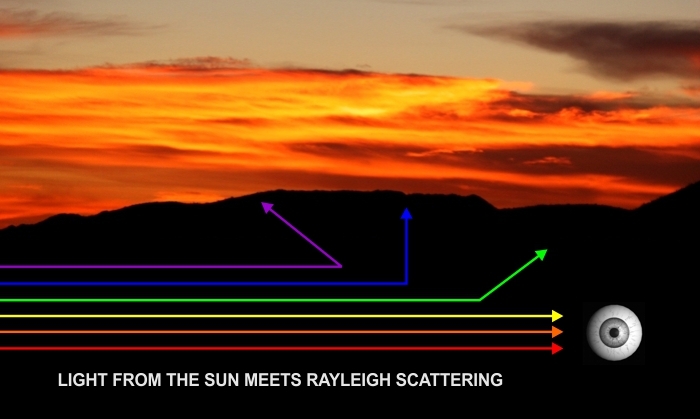 Due to an effect called Rayleigh scattering, shorter wavelengths of light (green/blue/violet) are preferentially scattered by N2 and longer wavelengths (yellow/orange/red) are not. Light tends to scatter off particles that are larger than its wavelength, and slips around particles that are smaller. In Arizona, desert dust suspended in the air further enhances the effect. These larger particles (10,000 nm) scatter even more of the longer wavelengths, deepening the oranges and reds. And you don’t need high winds to stir up that dust — though it helps. Even on a calm day, tons of finer dust (1000 nm) remain suspended in the air. See this AZDEQ report, specifically the chart on page 10. So when you look at the clear sky, you see all the scattered light (mostly blue). When you look at a sunset, the light that makes it to your eyes is what’s left … mostly yellow/orange/red. The same thing happens at moonrise or moonset, when you’ll see the Moon take on a similar yellow/orange/red tint. This is a cool test image!